JUVEDERM Ultra and JUVEDERM Ultra Plus Injectable Dermal Fillers for Facial Wrinkles and Folds instantly smooth away wrinkles around your mouth and nose. Our Expert injectors at New Radiance Cosmetic Center use Juvederm Ultra dermal filler in Palm Beach Gardens to smooth wrinkles and get natural-looking results that last up to a year or more. New Radiance of Palm Beach is one of the areas leading providers of Juvederm and has advanced experience with JUVÉDERM useing HYLACROSS™ technology. Juvederm XC (XC designation means it also contains a local anesthetic agent for added comfort during the injection process) improves comfort during treatment. 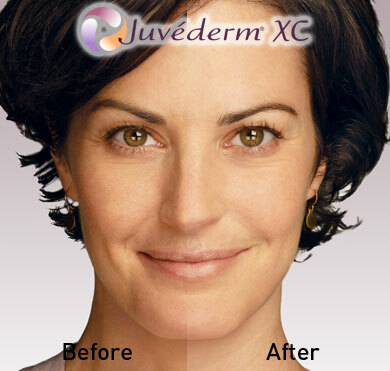 With JUVEDERM Ultra XC you get the smooth results you expect, with the improved comfort you want. JUVÉDERM Ultra Injectable Gel is a smooth consistency gel made of hyaluronic acid which is a naturally occurring substance in your skin that helps to add volume and hydration. Juvederm injectable gel is expertly placed under the skin to instantly restore your skin’s volume and smooth away facial wrinkles and folds,like your “smile lines” or “parentheses” also known as nasolabial folds (creases that run from the bottom of your nose to the corners of your mouth). What does Juvéderm Ultra Injectable Gel do? Juvéderm Ultra and Juvéderm Ultra Plus injectable gels are indicated for injection into the mid to deep dermis (below the outer layer of skin) in order to correct moderate to severe facial wrinkles and folds, such as nasolabial folds (the creases running from the bottom of your nose to the corners of your mouth, aka smiles lines). Juvederm Ultra Plus is better for larger areas and works to bring back lost padding to facial features. What is the difference between Juvéderm Ultra and Juvéderm Voluma? Juvéderm is available in two formulations to allow us to tailor treatment to your unique needs. Juvéderm provides versatility in contouring and volumizing lines around the lips and lower eyelid areas. Juvéderm Voluma is the newest HA (hyaluronic acid) soft tissue filler to join the family of FDA approved Juvéderm products1 in the USA. Voluma will help to restore the volume that is lost through the aging process and it is specifically indicated to restore lost mid-facial volume and is an alternative to Juvéderm® Ultra Plus. How is Juvéderm Ultra different from other dermal fillers? Juvéderm is the only hyaluronic acid (HA) filler FDA approved to last up to 1 year1. Juvéderm has a unique manufacturing process that provides a high concentration of cross-linked hyaluronic acid for long-lasting results. A smooth consistency gel, Juvéderm® flows easily into the skin providing a smooth, natural look and feel. All other currently approved hyaluronic acid dermal fillers are made of granular consistency gels. And, Juvéderm® is the first hyaluronic acid dermal filler that has demonstrated its safety and effectiveness in persons of color. What does the XC mean? XC just means it also contains a local anesthetic agent for added comfort during the injection process. How Long Does Juvederm Ultra Last? What are the Benefits of Juvederm Ultra? No allergy testing required, Feels softer than other Dermal Fillers available. What is the Cost of Injections of Juvederm in Palm Beach Gardens or West Palm Beach, FL? The cost of Juvederm Ultra and Ultra Plus varies depending on the extent of the injections. During your initial consultation, we will discuss the cost of Juvederm treatments as well as other fillers which may be used in conjunction with this dermal filler. How Do I Find Out if Juvederm Ultra is Right for Me? To find out more about Juvederm Ultra injections, please call one our offices (561-776-0116) to set up a private consultation to evaluate your skin to determine if this treatment is right for you.